(Nanowerk News) Researchers at Aalto University have succeeded in experimentally realizing metallic graphene nanoribbons (GNRs) that are only 5 carbon atoms wide. In their article published in Nature Communications ("Ultra-narrow metallic armchair graphene nanoribbons"), the research team demonstrated fabrication of the GNRs and measured their electronic structure. 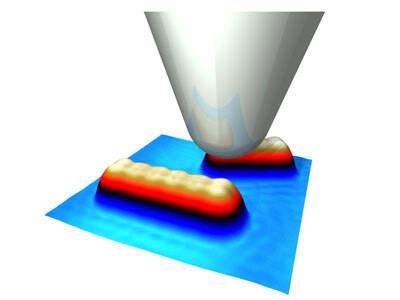 The results suggest that these extremely narrow and single-atom-thick ribbons could be used as metallic interconnects in future microprocessors. Schematic of the tip of a scanning tunneling microscope on a graphene nanoribbon. Graphene nanoribbons have been suggested as ideal wires for use in future nanoelectronics: when the size of the wire is reduced to the atomic scale, graphene is expected to outperform copper in terms of conductance and resistance to electromigration, which is the typical breakdown mechanism in thin metallic wires. However, all demonstrated graphene nanoribbons have been semiconducting, which hampers their use as interconnects. Headed by Prof. Peter Liljeroth, researchers from the Atomic Scale Physics and Surface Science groups have now shown experimentally that certain atomically precise graphene nanoribbon widths are nearly metallic, in accordance with earlier predictions based on theoretical calculations. The team used state-of-the-art scanning tunneling microscopy (STM) that allows them to probe the material’s structure and properties with atomic resolution. “With this technique, we measured the properties of individual ribbons and showed that ribbons longer than 5 nanometers exhibit metallic behaviour,” says Dr Amina Kimouche, the lead author of the study. The nanoribbon fabrication is based on a chemical reaction on a surface. “The cool thing about the fabrication procedure is that the precursor molecule exactly determines the width of the ribbon. If you want one-carbon-atom-wide ribbons, you simply have to pick a different molecule,” explains Dr Pekka Joensuu, who oversaw the synthesis of the precursor molecules for the ribbons. The experimental findings were complemented by theoretical calculations by the Quantum Many-Body Physics group headed by Dr Ari Harju. The theory predicts that when the width of the ribbons is increased atom-by-atom, every third width should be (nearly) metallic with a very small band gap. “According to quantum mechanics, normally when you make your system smaller, it increases the band gap. Graphene can work differently due to its extraordinary electronic properties,” says Harju’s doctoral student Mikko Ervasti, who performed the calculations. These results pave the way for using graphene in future electronic devices, where these ultra-narrow ribbons could replace copper as the interconnect material. Future studies will focus on all-graphene devices combining both metallic and semiconducting graphene nanostructures. “While we are far from real applications, it is an extremely exciting concept to build useful devices from these tiny structures and to achieve graphene circuits with controlled junctions between GNRs,” says Liljeroth.